It's December 12th. A 53-year-old man and his family are at Pennsylvania Station after spending a fun-filled day taking in the holiday sights in New York City. As they wait for their train, the man suddenly collapses. His son begins CPR while an Amtrak police officer quickly gets the portable defibrillator. The officer applies the pads, administers the shock, and the man's heart starts beating again. New York Fire Department medics and EMTs rush him to the hospital, but he's not out of the woods yet. Days of treatment and tests, surgery for an implantable cardioverter defibrillator, and weeks, perhaps months of rehabilitation lie ahead. But he is alive, because his son and a police officer knew what to do, and because an important piece of technology has now become readily available in many public spaces in the United States. This story is true, and it happened to my brother. I will never be able to fully express my gratitude to my nephew or to Amtrak police officer Aviv Citron, or to the entire team who cared for my brother In Penn Station and in the hospital. I am also very grateful to the inventor of the AED—the automated external defibrillator—but like most inventions, the AED was not the creation of a single person. On television, a doctor yelling “Clear!” after placing the paddles on an unresponsive patient has become a cliché. How does it work? 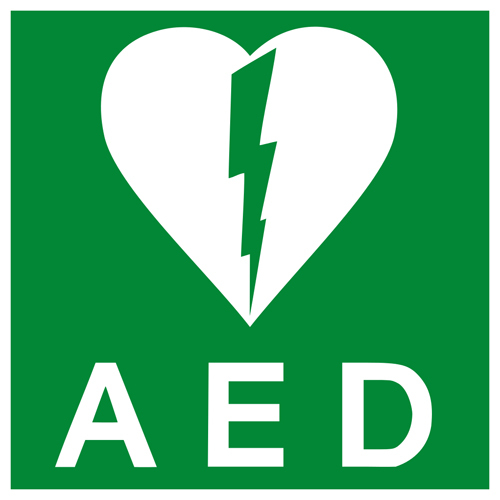 A defibrillator builds up a store of electricity (the “charging to 200” part of the television scene) in a capacitor and that charge is released in a burst. Whether the patient’s heart has stopped or is beating erratically, the shock is often enough to bring the heart back to a normal rhythm. The power of electricity to cause muscles to react (and the heart, after all, is a muscular organ) has been known for centuries, perhaps most famously through the 18th century experiments with frogs’ legs conducted by Luigi Galvani. The application of an electric shock to both cause and reverse ventricular fibrillation (or VF, an erratic beating pattern that inhibits circulation) in a dog’s heart was described by Jean-Louis Prevost and Frederico Batelli at the University of Geneva in 1899. They did not pursue this early work in defibrillation; instead, it was the electrification of the U.S. in the early 20th century that spurred the continued development of the defibrillator. In the 1920s, Consolidated Edison of New York, working with the Rockefeller Institute (now Rockefeller University), commissioned several universities, including Johns Hopkins, to undertake studies that would explain why so many linemen died after being exposed to even a fairly low-voltage electrical shock. A young electrical engineering professor, William Kouwenhoven, was a member of the research team at Hopkins. After observing that low-voltage shocks could send a human heart into VF, Kouwenhoven tried applying a second shock to a dog’s fibrillating heart, and discovered, like Prevost and Batelli before him, that the heart could be brought back to its normal pattern of beating. Cleveland surgeon Claude Beck performed what is believed to be the first open-chest defibrillation on a human heart in 1947, when a young patient on his operating table went into VF. For defibrillation to be more universally useful, a way to achieve the effects without cutting open a person’s chest had to be the next step. In 1957, Kouwenhoven’s team successfully tested their 200-pound prototype Hopkins A-C Closed Chest Defibrillator on a 42-year-old man. The challenge to then shrink the defibrillator to a truly portable size was taken up by several innovators. Kouwenhoven was among them; his team introduced a 45-pound version that fit into a plastic suitcase in 1961. In Ireland, John Anderson and his team at the Royal Victoria Hospital in Belfast produced a similar machine in 1969 and a 15-pound defibrillator two years later. From the moment you open the AED’s brightly colored box, audio instructions prompt you with simple commands. First, they tell you to place two adhesive electrode pads on your coworker’s bare chest, following the diagrams on the pad wrappers. The defibrillator’s built-in electrocardiograph automatically detects and analyzes the state of the patient’s heartbeat, and its software judges whether to administer a shock. Your colleague’s heart is indeed in ventricular fibrillation, so the AED asks you to approve the delivery of a tailored burst of electric current. ”Push the button,” announces a firm voice emanating from the box. There’s only one button, so you press it. Your coworker’s body jumps a little, and that may be all that’s needed to restore a normal rhythm to his heart. If not, the box prompts you to push the button again after some time. Thanks to your quick actions, your colleague is saved. Numerous companies continue to improve and simplify the operation of AEDs. Noting that “a cardiac-arrest victim’s chance of survival drops about 10 percent with every passing minute,” Kroll, Kroll, and Gilman highlighted the importance of making AEDs readily available. To that end, the American Heart Association Task Force on Early Defibrillation hosted conferences in 1994 and 1997 to design strategies for Public Access Defibrillation, or PAD. The number of AEDs in service across the U.S. today is somewhere between one and two million, but the story is not without its dark side. From January 2005 through September 2014, the FDA received approximately 72,000 medical device reports associated with the failure of these devices. Since 2005, manufacturers have conducted 111 recalls, affecting more than two million AEDs. The problems associated with many of these recalls and reports included design and manufacturing issues, such as inadequate control of components purchased from other suppliers. 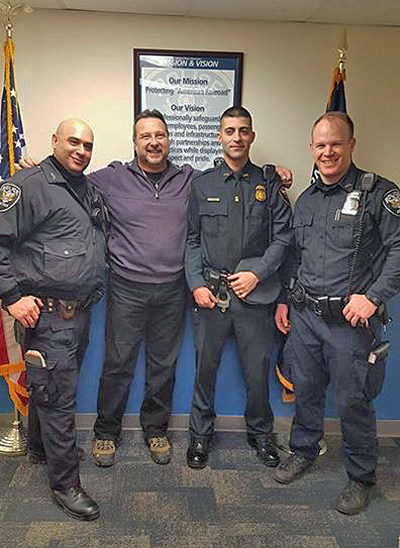 My brother visited the Amtrak police officers to thank them for helping save his life. They have my deepest thanks, too. Increasing the availability, visibility, and reliability of AEDs is an important goal. The passage of the 2000 Cardiac Arrest Survival Act was a significant step forward, mandating AEDs in all federal buildings. On the consumer level, a growing number of mobile phone apps are available to help bystanders locate and use AEDs. "Calling 911, starting CPR, and using the nearest defibrillator can mean the difference between life and death for victims of sudden cardiac arrest,” asserts Dr. Bobby V. Khan, chairman of the board of the Sudden Cardiac Arrest Foundation. My brother is living proof that he's right. The banner image at the top of the page is by Stealth3327, courtesy of Wikimedia Commons.